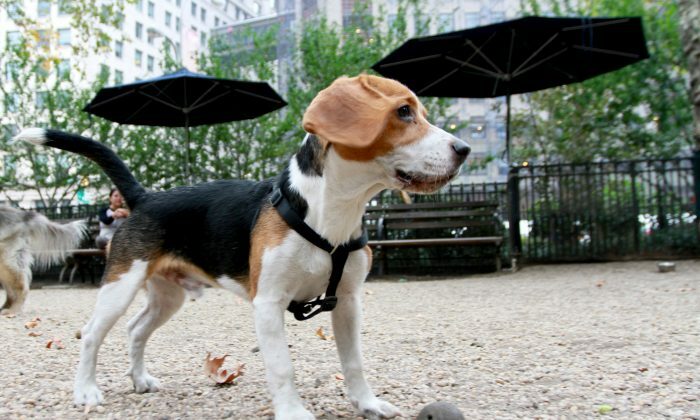 NEW YORK—Paws in the gravel, eyes on the ball, Achilles charged forward leading a pack of dogs—some four times his size—to chase a ball at the dog run at Madison Square Park. Tiffany Gentry, a tutor, noted his bravery when he was just an 8-week-old puppy and gave him the mythical name. She was surprised that he wasn’t afraid of people, other dogs, and traffic. As Achilles nosed a dry autumn leaf back and forth with a fuzzy, dazed puppy, Gentry spoke about the difficulties and rewards of having a dog. The first few weeks were the most difficult as she realized she had to be with the puppy constantly. She cleaned up a lot and learned to bribe her friends with lunch so they would take care of Achilles when she was away. As a child Gentry had a golden retriever but she barely remembers the dog. She always wanted a puppy and eventually adopted Achilles from a family in New Jersey. At his most heroic, Achilles is a bit of a martial artist. His special move is a jump with a full body rotation. When less heroic, Achilles loves his squeaky green and pink caterpillar stuffed toy. He cuddles with it when he goes to sleep. Gentry’s life changed drastically after she adopted Achilles. But the difficulties were worth it—she can now go on all day about the benefits. Gentry’s social circle also expanded when she took Achilles to dog parks. When Achilles was young, he was very social, making friends with people and other dogs. “He’s very sweet, usually gentle, energetic, loving, and adventurous,” Gentry said.